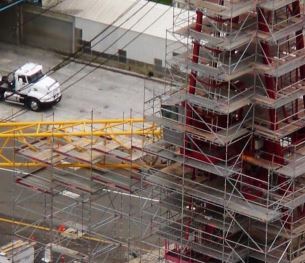 Scaffolding this crane at the Port of Napier, New Zealand, presented a few technical challenges for Scafit, as well as ensuring health and safety concerns were adequately addressed. “It was like scaffolding in a bowl of spaghetti,” said James Winter, Supervisor for Scafit. The scaffold needed different bay sizes off the U-bridging ledgers to adapt to the changing contours of the crane.